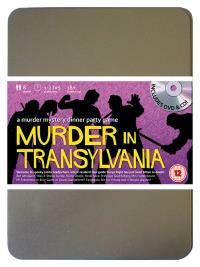 You've been invited to play the role of HEIDI SEEK in Murder in Transylvania. Who killed Sonya Right? Welcome to Castle Gladjorhere, home of the world’s one and only Transvampire with a soul! Visitors from all walks of life have come to witness the thrills and chills of this genuine Transylvanian house of horror, all of which will be revealed by the resident tour guide Sonya Right. But shortly after dinner Sonya is found in her room with two small puncture wounds in her neck. Join us to find out who sucked the life out of her! Local journalist (she’s always exposing things!) Costume Suggestion : As a famous reporter you like to fit in, so a blue trouser suit is your preferred attire. However, the pen and pad you constantly have in hand gives away your profession, along with the enormous “Press Pass” badge that hangs around your neck. You are a reporter with the Transylvanian Tribune. You moved to Transylvania five years ago from Switzerland, where you lived with your grandfather in a cabin in the mountains. You were a very sick child, which is why you’re very pale. Although you’re still quite new in the newspaper biz, you’re determined to make a name for yourself by digging up scandalous stories before anyone else.